Hackett says problem areas will be addressed quickly. LONDON -- Ford's sudden replacement of CEO Mark Fields with turnaround specialist Jim Hackett has put its European operations under scrutiny -- with industry watchers speculating whether the company will exit the region like its crosstown rival General Motors. Europe is making a profit for Ford again after three years of losses between 2011 and 2015, but the margin is still very thin at just 2.3 percent for the first quarter. Toughening regulatory pressures on tailpipe emissions, especially for diesel cars, which account for half of Europe's market but don't sell in big numbers elsewhere. "We need to speed-up decision making and address under-performing areas," Bill Ford, the automaker's executive chairman, told analysts and reporters on Monday when announcing Hackett's appointment. 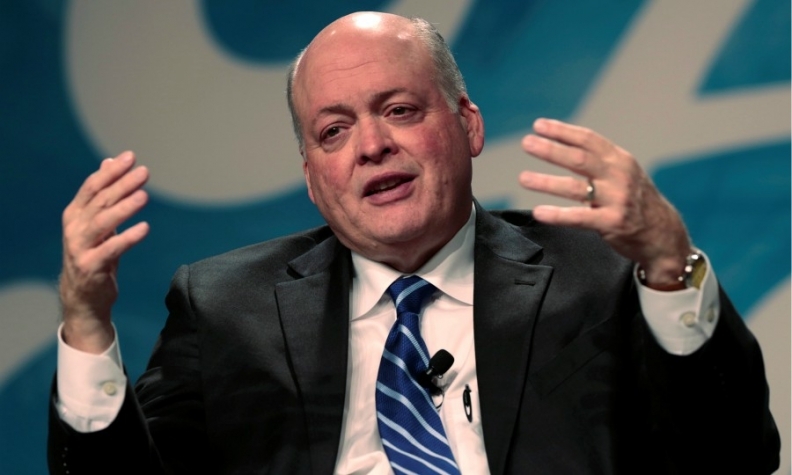 Hackett, 62, turned office furniture manufacturer, Steelcase, into a global leader and has led the Ford unit developing self-driving cars and related projects for the past year. GM's focus on improving shareholder value by selling its unprofitable European brands, Opel and Vauxhall, to France's PSA Group, as well as quitting tough markets such as Russia, India and South Africa led to criticism from investors that Fields was moving too slowly to restructure the automaker. "Those things are front and center on the agenda — very quickly," Hackett told the Detroit News in an interview on Monday, referring to Ford's presence in India and the future of small cars in the U.S. market where SUV sales are booming. "There’s a long list like that. We will address all those." Ford has already shown it will quit markets that aren't working for the company, including last year Japan and Indonesia. It is scaling back its car production in Thailand to focus on pickups. Ford said earlier this month it plans to cut 1,400 salaried jobs in North America and Asia through voluntary early retirement and other financial incentives to help boost its sagging stock price. A Ford of Europe spokesman told Automotive News Europe on Tuesday: "We are not about to exit Europe." The cuts will not apply to Ford in Europe where last year the automaker reduced its workforce by 1,000 to 52,000, mostly losing white-collar jobs. However, unions fear Ford is preparing to ax jobs in the UK following Brexit and have said they will fight potential job losses of 1,160 at the automaker's engine plant in Bridgend, Wales. Europe as a whole has a 21 percent manufacturing overcapacity in 2016, according to a IHS Markit analysis cited by Ford in its 2016 financial report. Ford didn't mention what its capacity figure was for Europe, where it has 16 plants. The UK is Ford's biggest European market, but Ford has said its 2017 European profits will be lower because of the pound has collapsed since Britons voted last June to leave the EU, making its cars more expensive. The company posted a record $1.2 billion European profit last year. In the first quarter pretax profit in Europe was $176 million, its eighth-consecutive quarterly profit. Ford will need to re-evaluate areas of the business where it continues to struggle to meet its cost of capital just as GM has done by exiting from regions and Fiat Chrysler Automobiles has done by abandoning some segments, Ellinghorst said. "Ford should consider regional and product exposures as well as the future of Lincoln," he wrote in a note to investors. Bernstein analyst Max Warburton believes Ford is unlikely to follow GM and quit Europe. "Ford of Europe is in better shape than GM Europe. European industry pricing is the best it has been in 20 years," he told Automotive News Europe. "I also sense that the Ford family have an emotional attachment to Europe. And even if they did want out, the only buyer in town just bought GM Europe." Ford has a strong manufacturing footprint in low-cost eastern Europe and Turkey, which GM didn’t have. Ford builds the EcoSport small SUV in Romania and vans in Turkey. Its vans were market leaders in Europe in 2016, according to Ford. Ford also has worked to reduce capacity in the region over the last few years, closing its factory in Genk, Belgium, and two plants in the UK. Apart from anything else, Ford doesn't have a standalone brand to sell to another player in Europe, like GM did with Opel and Vauxhall. A buyer could hardly continue to use the Ford name. But the problem is unlikely to arise. Said Warburton: "My guess is ‎Hackett will have lots to focus on before he needs to worry about Europe."